Term has begun – at least for a good proportion of schools anyway. I did the nursery run Yesterday morning, taking our eldest to nursery and our youngest to the child minder. The pavements were thronging with adults and young people fresh-faced and ready for the new term. It brought back lots of happy memories of when I was at that stage. One of the things that I remember was how it always took me a while to get back into the way of writing with a pen or pencil. Several weeks without having cause to do so had left me out of the way of it. It soon came back though. For some this term, particularly the younger ones, writing will be a new discipline whereas for others it will be something to re-learn. Woven into this, in our digital era, is also the use of technology. Perhaps getting used to typing will throw people off their game. There are lots of things that we set down in life to then pick up later. They come back to us at varying speeds. For me one has been music. I used to be reasonably good on the violin when I was younger, however I fell out of the habit of practice. I wonder if there will be music teachers this term holding their breath as they wait to see who has practised over the summer and who has not? When I did blow away the cobwebs from my violin later in life I was frustrated at first. My fingers kept crashing into one another. Eventually it started to come back but I soon realised I needed some help. A few lessons later I was starting to get back up to scratch. It was a joy to welcome the once familiar melodies that I had known back into my life and to once again have the use of the violin as another string to my bow (!). In the ebb and flow of church, this time of year is often when we ‘re-start’ different things. Meetings or groups that have taken a break over the summer once again swing into action. I wonder if you’ve ever had the experience of re-starting something only for it to feel a bit odd at first? This can often be a similar experience to the school child who picks up the once familiar pen or pencil. Have you had the experience of falling out of the habit of faith? I can say with confidence that you would not be the first and it is certainly something that I have experienced. There have been times when the habit of prayer or bible reading have faded in my day to day life. There is no time like the present to get back on track and sometimes we end up realising that we need a wee bit of help along the way. Like me and my violin it is great when we can get some pointers from a kind and patient teacher. There are always lots of good folk ready to help us get back into the rhythm of faith. 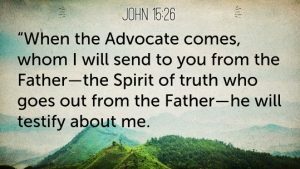 Further though, we must never underestimate the work of the Holy Spirit in our lives to help us know God more and trust in Him. 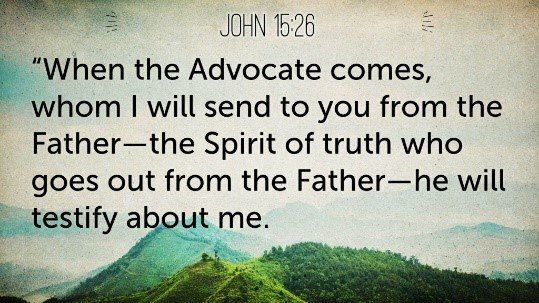 John gives the Holy Spirit the term ‘Advocate’ in the verses quoted above (John 15:26). A wonderful description and a wonderful hope. Of course, there is always a first time to discover the world of penmanship, musical melody and also the experience of knowing and trusting in God. Maybe you feel prompted to explore something new that you’ve never known before, and maybe that new thing is faith? We’d love to welcome you to come and join us in our journey.